Use a binder ring and feed it through the hole in the packaging. You can find these at your local office supply store. Use one ring for all of your colors or several rings and group them by like colors. Next, use scissors to cut an opening though the bag. CUT ONLY ONE LAYER of the bag. Avoid cutting to the bag’s edge or it might rip completely from the label. If it does happen, then just reinforce the cut ends with tape. You only need a hole big enough to pull one end of the paper out. 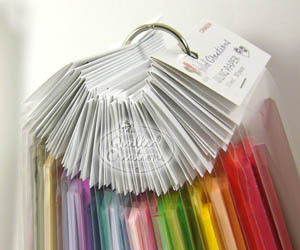 With multi-colored quilling packs, I use zip-lock bags or the 6″ x 9″ bags that our kits are stored in. I try to keep like colors together. It doesn’t always happen, especially when I’m in a rush to take some quilling paper on a trip or for a class. But the bags helps store those loose strips of quilling paper. Another tip to hold your mixed/multi-colored paper packs (or papers from a quilling kit), is to fan the paper out and use a binder clip at one end of the paper. At the other end, cut or tear off the glued ends so that the strips are all separated. Then when you need a certain color, you just tear if off the binder clip. Hang all of the papers so that they are within easy reach. Hope this gives you some ideas for an organized craft/quilling area!! 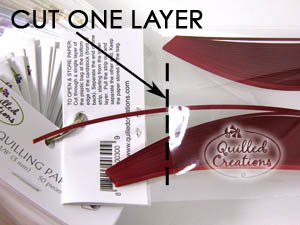 I store quilling strips in their original packaing in a Clear 12 x 12 IRIS storage container. I remove label from quilling paper package, insert back of label into package with double sided adhesive tape, insert white cardstock into quilling paper packaging, tape front of label on front of package. I file packages by color, width size or numerically. Bonus is I can store containers in bookshelves like books or stack them in storage units, under craft table or desk. Storing them in plastic containers with snap tight lids prevents moisture and/or water damage. I'd be embarrassed to show you my papers, mostly shoved into baggies. I will defiantly be trying your hints. I just keep my strips in small stackable storage containers. They are see through, which helps when selecting brands and colors. I must admit sometimes It can be a little taxing looking for a particular color. Neatness and organization really counts with this craft, cause it does not take long to create a mess. Excellent, yet simple, suggestions, Alli!! I have two small craft storage units with three drawers each. About 3 feet tall each. Unopened packages of size 1/8 inch width and under going into one separated by colors hot/cold/green, lol. The other has larger width paper. I have five bins on the floor with opened paper and shapes. You do not want to see those at all. I tried using baggies for the opened ones but I keep pulling them out to use and end up with a larger mess. I have projects ranging from 3ft. x 5 ft. and 11x14 in. and several 8x10 in. with one or two 5x7 all going on at the same time.I have a stack of finished projects that all need matted and framed. I have finished items, ex. snowflakes, that need mounting. I have three more bins with just my tools and glue.This doesn't count all the cardstock and quilling books I have to hand. All this mess is in my living room as I have no other place to work. I would love for someone to come up with a way to organize this for me. I just gave up. i use small rouse curtain rods ring the king you have squeezes the ends (mettel) . then cut a hanger add rings of quilling papers . put 2 small craft sticks one on each side then tape. when needs to add more paper just cut the tape. add to your craft room works perfect. Wow! Thanks for this tip. I am going to be getting started in quilling and I hadn't really thought about storage yet. 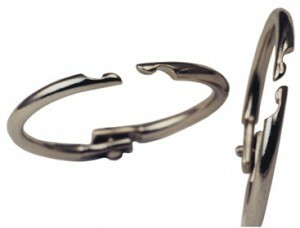 I really like the binder rings and clips ideas. That would make them so easy to hang up on a hook. This idea is brilliant and has completely organized my paper stash. I love seeing all the colors so neatly available and appreciate that the papers no longer become a tangled, crushed mess in ziploc bags. Thank you for sharing this tip. I store my paper strips in empty paper towel tubes. I hot glued them into a honeycomb shape. Not only efficient but pretty! I have to store everything in cat-proof containers. I tried hanging them with the binder clips and while I was grocery shopping my cats managed to eat most of my paper. I now use stacking storage bins, one for blues, greens, reds, pinks, etc. 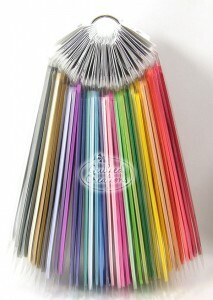 i think this is a wonderful, inexpensive idea for keeping my strips organized and not get damaged. Easy way to take inventory of the colors that I do have. Any recommendations on getting my current strips where they will hang properly? A majority of my paper is 24" long. I do prefer the shorter strips. Thanks so much. Currently i have all my papers in a craft paper storage box. I have the various fringed packsges in tp tubes to keep organized and untangled. My new packages are still closed in the packets. I am going to buy a package of smoothie straws. I saw a posted picture that someone used straws to separate each individual color. I like that idea to make my mess of papers more manageable. Plus i only need what I am working with. It will be easy to taske when working on a project somewhere else or if i am in the hospital.